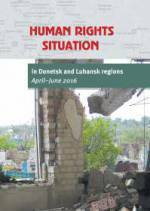 Human Rights situation in Donetsk and Luhansk regions (April–June 2016) / Yurii Aseev, Aleksander Cherkasov, Sergey Davidis, Vladimir Malykhin, Oleg Orlov, Aleksander Pavlichenko, Yan Raczynski, Yana Smelianska. — Kharkiv: LLB “Human Rights Publisher”, 2016. — 64 p.
From March 28 to April 2, 2016 and from June 20 to June 26, 2016 the joint trips of the Russian and Ukrainian representatives of non-governmental organizations (members of the Human Rights Center “Memorial” and Kharkiv Human Rights Group) to the ATO zone in the Luhansk and Donetsk oblasts in the territories controlled by the Ukrainian government took place.